Two years ago I decided to create a Reader Survey to realign SavingsPinay to its goals and vision. I love how the result went and if you've been part of the 2014 SavingsPinay Reader Survey, thank you very much for taking time to answer. Before 2016 ends I wanted to do another Reader Survey to help create a better blog for you. I want to know what you like, what you need and what you want in general. If you believe in SavingsPinay and you feel like you deserve a better content and a better blog I hope you can take a few minutes to fill out the survey. Five minutes is all it thanks and I assure you that the questions are very easy of course. Please take my 2016 Reader Survey whether you've been a long-time reader or just a new visitor. 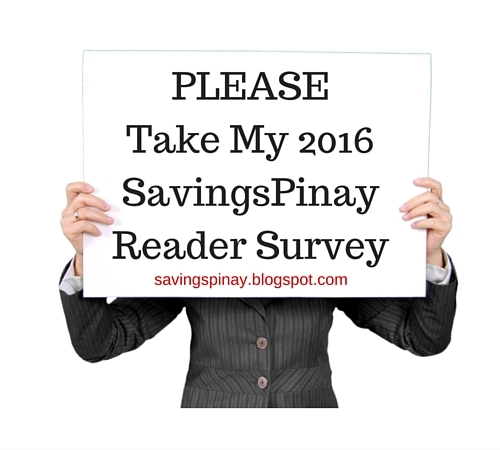 1 comment on "2016 SavingsPinay Reader Survey"